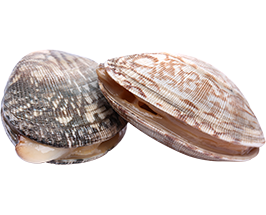 The Mediterranean striped venus is a bivalve mollusc in the Veneridae family, widespread in the Mediterranean and eastern Atlantic. The term ‘clam’ groups many genus and about 400 different species around the world. The Mediterranean striped venus is known for the delicacy of its flesh and the low energy input, features that give it considerable commercial success. It reaches 2 or 3 cm in size. It is a filtering organism that mainly feeds on plankton. It is harvested on sandy coasts using fishing boats fitted with a hydraulic dredge or suction dredger known as clam dredges.